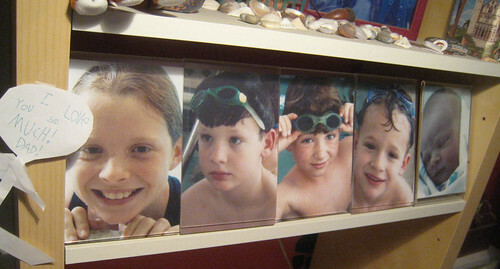 I gaze at these 5 cute little faces peering down from my bookshelf every day. Where does the time go? Already 2 in college. Yikes! I can remember taking those pictures like it was yesterday. Now it seems like it’s only tomorrow that they’ll be off on their own. Will they have the basic life skills they’ll need to thrive in the real world? I sure hope so. It can be harsh out there. Tip 1: Set up a simple family banking system. Give your youngsters an account at the “Bank of Mom and/or Dad” where they can make deposits or withdrawals and keep an eye on their balances while they save for their own purchases. My favorite resource for this approach is the book The First National Bank of Dad by David Owen (works for Mom’s too!). You don’t really have to read a whole book though. The idea is really simple. You run the bank and you keep track of your kid’s deposits, withdrawals, and account balances. The current balance represents an IOU from the parent (the bank) to the child (the customer) — just like a real bank. You can even offer interest on deposits to encourage good saving habits. You can keep track of your bank in a simple paper ledger, in a spreadsheet, or in one of the growing number of online virtual family bank offerings built for this purpose. Review a “bank statement”, savings goals, and budgets with your child regularly as a way to maintain an ongoing, practical dialog about personal finance. Tip 2: Start early, start simple. I like the idea of starting your family banking system the moment your child asks you to buy something — that first discretionary purchase request. It’s the perfect teachable moment to start discussing wants vs. needs, what a bank is, how to save, and how to make purchasing decisions. The longer you wait, the more you encourage the “gimmies” and a growing sense of entitlement. Do yourself and your child a favor: nip that at the bud. We opened our youngest child’s first account at the “Bank of Mom & Dad” when he was 4. Initially. it was just a safer place to keep his money. When you have four older siblings, an unsecured piggy bank is a very risky repository! He deposited loose change he found under car seats, the occasional quarter from Mom for helping out with an odd job around the house, and his very first “paycheck” — a gargantuan $20 windfall from a photo shoot he did for a local parenting magazine. His very first purchase was a Hot Wheels Car for $1 followed by the classic video game Frogger for $19.92. His first donation was to the Polar Bears via the World Wildlife Fund after saving up for 8 months in his charitable account. These were very proud, self-reliant moments. I’d recommend starting simple with a single account (or just a piggy bank) and a single purchase goal. As your child matures, you can add sophistication to introduce increasingly advanced concepts. You might add multiple accounts to distinguish between spending, longer term savings (perhaps with compound interest), and charitable giving (we did that at age 6 with our youngest). As you approach the teen years (gasp! ), you might consider making loans for big ticket items like a laptop computer and establishing a formal budget with matching allowance for a specific area of spending like clothing. Tip 3: Match your system to your values. There’s no shortage of definitive advice out there for parents when it comes to kids and money. (You can read over a thousand articles here.) Pay them an allowance. Don’t pay them an allowance. Pay for chores. Don’t pay for chores. Get a job. Don’t get a job. Never loan them money. Loan them money, but make sure they pay you back. Never give them a credit card. Give them a credit card, but teach them now to handle it. And so on. I don’t think there’s one right answer to any of those questions. In fact, we’ve used a hybrid system with our kids over the years that includes regular allowance split between spending/saving/giving, expected chores (with penalties for blowing them off), paid extra jobs, compound interest on savings, loans for big ticket items like computers, clothing expense accounts with formal budgets, debit cards, and, in the end, credit cards. We’ve found that the right approach varies with situation, age, and even from kid to kid. Our 5 kids are very diverse. In my opinion, the most important thing is to have a clear, explicit system that is consistent with your family’s values and your family’s situation. Then, let your kids practice and make mistakes while under your guidance. Better now than when they hit the unforgiving real world. I love that you can still remember exactly what the first purchase was and the first charity donation! And I think your final point about there being no single system that "fits all" is spot on. It's like parenting. You do what's best for the child and the family, and then adapt as you go along. My other favorite quote for parenting is "The days are long, but the years are short." My memory is like a leaky sieve, so I wouldn't be able to remember those details without the help of FamZoo. Just had to page way back in his online account register to see all the transactions from those days. It's actually one of the hidden benefits of formally tracking things is a system (whichever one you choose): you can take a periodic trip down memory lane. Purchases are often a very interesting reflection of life/history. Apparently, some biographers look at the check registers of their subjects for that reason. Cas, thanks for reading and leaving a comment. You'll be starting nice and early with your two kids, so you've nailed tip #2. Great tips! I think I'm a failure in this aspect because I'm not good in handling our family finances. However, for this year, I plan to overhaul my spending habits so that I can instill good money habits on my kids too. The neat thing is that as parents start working systematically with their kids on good money habits, they tend to clean up their own money habits. So, I wouldn't wait. Hi Bill, great article and am happy to see the last tip that would typically go without mention, awesome! Wanted to share our approach for the banking system, and that's my iphone notepad. We started about 3 years ago and entries go in with a + and - followed by the balance. That way it's always with me at the stores and they are proud to "deposit". Also wanted to add another tip related to money events such as bdays and CHRISTmas. My 8 yr old saw his $200+ balance after these two events (happen closely for him) and instead of wanting to pick up more toys off the floor, I educated him to the stock market. He picked out his own stocks and I set them up as the guardian. He made $37 in 2012 and has been so proud of his stock splits and shopping at companies where he owns stock (yes, the dollar stores, pet stores and toy stores). He looks for his statements to come in and researches companies that might invest after upcoming Christmas'. We are a middle-class family, so I ask that parents don't underestimate their child's potential. Have a great day Bill! Iris, I like your nice simple iPhone notepad based account system - great tip. If folks like more bells and whistles, they can check out our Virtual Family Bank system with it's iPhone app access here: https://itunes.apple.com/us/app/famzoo-family-finance/id399321476?mt=8 That way, the kids can access the accounts on their own via mobile or web and parents can set up more sophisticated "family banks" with allowance/chore systems, splitting between spend/save/give accounts, interest, matching contributions, savings planners, loans, and so on. Educating your child about the stock market is awesome. Kudos! The important thing is that he learn both sides of the risk/reward equation. It's all smiles when your risky one-off picks pan out, but often they won't. He'll need to learn that some years he'll lose $37 or more. A next great discussion might be all about diversification and what a market index fund is as well as a discussion about taking the long view when it comes to investing. Thanks so much for stopping by and sharing your thoughtful comments! Ricky, thank you for the kind words. It's not too late! Our new prepaid card support makes FamZoo perfect for college students. Unlike a checking account and/or credit card, there's no risk of overdraft or running up a debt. Be sure to turn on the text alerts which give balance feedback immediately after every purchase - that simple little feature is proving to be extremely helpful in keeping my college age kids on budget.